The original idea behind the character of Ronald McDonald was to more or less capitalize on the popularity of the iconic Bozo the Clown, with initial efforts on this front simply advertising on that children’s show in the Washington D.C. area. When this succeeded in getting kids to drag their parents to McDonald’s, in 1963 McDonald’s decided to create their own similar character, with the first to portray the Bozo knock-off being none other than Willard Scott, who would later go on to much more prominent fame for his decades of work on The Today Show. Wanting to expand the character, McDonald’s hired Ringling Bros. clown Michael Polakovs, better known as Coco the Clown, to re-do the look of Ronald McDonald. You see, at the time Ronald’s garb featured a cardboard tray for a hat and a paper cup over his nose- not exactly prime time material. What Polakovs came up with is the now iconic look of the character. With this, Ronald McDonald was ready for the big-time, at which point Scott was promptly fired from the role in 1966 and Bev Bergeron was hired to take his place. While you’ll often read Scott was fired for being too fat, which would be kind of ironic if true, this seems unlikely as Bev Bergeron had many more tires in his trunk than Scott at the time. From this, it seems more likely that Bergeron was probably hired as he was vastly more qualified for the role, with an extremely impressive resume as an entertainer, magician, and clown. In fact, later in life he would actually receive a Lifetime Achievement Fellowship Award from the Academy of Magic Arts and Sciences. Speaking of that switch, “officially” McDonald’s publicly only recognises nine men as having played the character since the 1960s when he was created. Or to put it another way, if McDonald’s is to be believed, more men have walked on the moon than played Ronald McDonald. The reality though is that hundreds, if not thousands of actors have portrayed Ronald over the years, with said actors usually being tasked with being the Ronald for a specific area or set of McDonald’s restaurants. Save for a few scant references to the handful of men known to have portrayed Ronald in an official capacity, McDonald’s as a company otherwise insists that Ronald is real and that there is only one of him. Towards this end, the company has rules in place that prevent two or more Ronalds from ever appearing in costume at the same place at the same time, with the one apparent exception being a secret convention the company holds for Ronalds it sometimes refuses to admit actually happens. Meaning it’s the official position of McDonald’s as a company that not only is Ronald McDonald real, but that he has magic powers. So as to not break the carefully crafted illusion that Ronald is real, men playing him are forbidden from disclosing their real identity in costume and even from taking the costume home with them. As an idea of how seriously the actors playing Ronald take this, we’re aware of at least one example of a Ronald being detained by police as a direct result of the “no admitting you’re just an actor while playing Ronald” policy handed down by McDonald’s. Specifically, after an actor in full Ronald McDonald costume and makeup got into a minor car crash in Saginaw, Michigan in 2000, they were temporarily detained after being asked to give their real name and hilariously refusing to respond with any other name than “Ronald McDonald” to the police. In addition to being expected to never disclose that they’re an actor just playing a part while in costume, out of costume actors who play Ronald similarly aren’t supposed to acknowledge that fact, instructed to refer to themselves as “Ronald’s helpers” when asked what their job is. Understandably, given the character’s position as the face of their brand, McDonald’s takes the training of prospective Ronalds incredibly seriously, putting anyone wanting to don his iconic outfit through an extensive and grueling training program. While this training program has evolved somewhat over the years to reflect the changing climate surrounding the brand and its products (more on that in a moment), it is mostly the same as it was back in the 1970s and follows the rules and guidelines set out in a book titled Ronald and How. This was penned by a former Ronald named Aye Jaye, with the help of advertising executive Roy Bergold. At this point, Jaye was serving as the company’s “boss clown” (a role that mainly involved overseeing the hiring and training of Ronalds). As you might have guessed from the title, the book teaches actors everything they need to know about being Ronald McDonald. For example, along with containing information about the character’s history, Ronald and How gives practical advice on everything from applying makeup to walking around in those ridiculous shoes. The book also teaches Ronalds how to interact with children in a non-creepy way, which when playing a clown is always a difficult task. For example, given the rampant stigma against strange men interacting with random children, the book carries a stark warning- “never to initiate a hug”, instead suggesting Ronalds respond to a child trying to hug them by turning to the side and patting the child on the back. With this in mind, it’s probably not all that surprising that prospective Ronalds are also subjected to extensive background checks. Ronalds are also constantly tested on their suitability for the role by official Ronald trainers who are given the power to fire a Ronald on the spot for any reason if they ever don’t measure up to the exacting demands of the company. Amazingly, these trainers also have the power to put actors playing the character on “Ronald probation” to let them know they need to literally get their act together. According to Geoffrey Giuliano, who played Ronald for about a year and a half in the late 1970s, one of the more unusual rules they also have to follow is never eating McDonald’s food in costume. This is reportedly as it might smudge their makeup. Giuliano has also claimed that he was forbade by McDonald’s brass from informing children how McDonald’s hamburgers were made. Instead, if a child asked where hamburgers came from, the Ronalds are instructed to give a stock response about McDonald’s burgers being grown in patches where they are picked whole. According to canon established by the ads, McDonaldland is a place in which McDonald’s food grows naturally in a world being populated with things like french fry bushes (which we actually think is a way better name for the potato plant), trees that bear piping hot McDonald’s apple pies, and volcanoes filled with milkshakes instead of lava, which would have made the whole historic destruction of Pompeii a lot more fun. One can only imagine how Pliny the Eldar’s supposed “Fortune favors the brave” statement might have morphed. As you might have guessed, Ronald McDonald hails from this magical land and throughout the 1970s seemed able to travel between it and our own world at will somehow. As time went on though, Ronald was shown visiting McDonaldland less and less, with modern ads and promotional material suggesting that he has seemingly decided to live in our world permanently. A thing worth noting is that, according to McDonald’s, Ronald’s goal has never been to sell McDonald’s food but promote values the company considers integral to its brand. In fact, officially Ronald’s position within McDonald’s is that of national spokesman. McDonald’s maintains then that Ronald is merely an ambassador for goodwill and happiness and that his main concern has always been fun as well as educating children about “important subjects, such as fire safety, exercise, health and hygiene, anti-bullying, self-esteem and literacy”. Of course, many of these lessons take place inside McDonald’s restaurants, not to mention all of the ads with Ronald where he’s clearly trying to sell McDonald’s food to children, but we digress. The first rumblings that McDonald’s were considering ways to revamp Ronald came about in 2002 when rumors began circulating that they were going to reduce visibility of the character in promotional material in the wake of sustained negative coverage of the brand and accusations that it was playing a role in the childhood obesity epidemic. He reminds me of Mickey Mouse — iconic but dated. The kids have moved on. In truth, it would appear from accounts of former Ronald McDonalds, the gig pays anywhere from about $40,000 per year on up to nearly half a million dollars per year, depending on what district one is assigned, how prominently McDonald’s chooses to use you, etc. In fact, the top Ronalds reportedly even get their own fancy office with secretaries and bodyguards to boot, with the latter apparently necessary as older children sometimes like to throw things at Mr. McDonald, and some adults also behave badly towards him. In any event, in 2005, McDonald’s pitched Ronald as a “global ambassador of fun, fitness and children’s well-being”, releasing a series of ads showing him tearing it up on a snowboard and juggling fruit. These ads coincided with a fundamental shift in how McDonald’s trained Ronalds, with the company making it known that any actor wanting to play the character now had to be fit enough to sell the idea they could do everything Ronald did in the ads. According to insiders, McDonald’s went as far as to straight up fire long-time Ronalds it felt were too out of shape. At the same time the company also began training Ronalds to give basic health and nutrition advice to children as well as to teach games that doubled as exercise. However, to ensure uniformity amongst Ronalds, the advice they are able to give is limited to stock, scripted answers handed down by McDonald’s, and Ronalds are under strict instructions to never, ever go off script, being told to tell any curious children or adults asking questions they don’t have a scripted answer for to “ask someone wearing normal shoes”. Following this and the somewhat lackluster response from the public to this change, McDonald’s once again slowly began downplaying the role of the character in advertising, occasionally responding to comments and queries about Ronald’s continued status as the company’s mascot by saying that, while Ronald was still around, he was focusing his efforts on promoting Ronald McDonald House Charities. And here we should note that while Ronald was less visible in McDonald’s advertising, the company still had hundreds of official Ronalds on its payroll across the globe to promote the brand in person and at various events. Unwilling to let go of the character, however, in 2012, McDonald’s decided to try and revamp Ronald again, quietly hiring Tony Award winning designer Ann Hould-Ward to secretly work on updating his look. Unveiled to the world in 2014, the new Ronald ditched his old yellow jumpsuit for a goofy looking shirt and bow tie combo, accessorised with a garish red blazer. 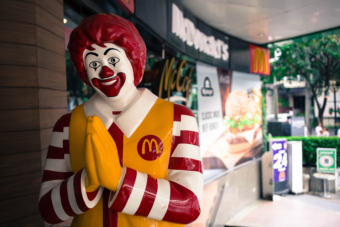 The change in look coincided with an announcement from McDonald’s that Ronald would be taking an active role on social media and that he was looking forward to hearing feedback about his new outfit. Although McDonald’s would later claim that Ronald’s foray onto social media was a rollicking success, his new look was near-universally derided to the point that the top trending phrase on Twitter the day the new outfit was revealed was “NotLovinIt”. Commentators additionally noted that the change came off as more desperate than anything and that it was clear the company had attempted to make Ronald look less, well, clown-like. Selfies …here I come! It’s a big world and now, wherever I go and whatever I do…I’m ready to show how fun can make great things happen. In response to these events, McDonald’s released a statement noting that Ronald would be limiting the amount of public appearances he made due to the “current climate around clown sightings in communities”. Officially, as of 2018, Ronald is still very much (apparently) a slave labor employee of the McDonald’s corporation and the company maintains that he’s not only real but have acknowledged that he possesses both magical powers and is presumably immortal due to the fact they’ve noted he will likely continue to serve in his role as a brand ambassador, spokesman and advocate for a healthy lifestyle forever, and has never appeared to age. So, just to recap, rather than admit that its company mascot is just a series of guys in a costume, McDonald’s instead maintains that one of their employees is actually an ageless magical clown hailing from another dimension that can bend reality, space and time to his will and tries to attract children to his abode. A fact that’d be hilarious if it wasn’t also the exact plot of IT. In 2015 McDonald’s similarly tried to update the look of another famous mascot, the Hamburglar with less than stellar response. Like with Ronald, the company absolutely maintains that the character is real and when asked to explain away his absence from any McDonald’s advertising up that point, a spokeswoman from the company claimed that he’d simply “been lying low and living a quiet life” until that exact moment. Speaking of burglaries, in 2005 a 22 year old man by the name of Ronald MacDonald robbed a Wendy’s fast-food restaurant (stealing the money in the store’s safe) where he worked at the time. About 3 billion pounds of potatoes are used to make McDonald’s fries every year. This is about 8% of all potatoes grown in the United States or a half a percent of all potatoes grown in the world per year. An average beef cow (200 kg of usable meat) produces enough meat to make about 4,500 hamburgers at McDonald’s. If you’ve ever wondered why there is often a second capital letter in surnames starting with “Mac” or “Mc”, this is because “Mac” and “Mc” are prefixes that mean “son of”. Early inconsistencies in records are what led to having both Mc and Mac prefixes. Mc is just an abbreviation of Mac, and both can actually be abbreviated further to the much less common M’. So someone with the last name of MacDonald is sort of like someone with the last name of Johnson—likely, each had ancestors with the name of Donald or John respectively. From this, you can probably see why Mc and Mac names typically contain a second capital letter. Since proper nouns are capitalized, you would write “son of Donald,” not “son of donald.” In the same way, you would usually write MacDonald rather than Macdonald, but there are obviously exceptions. Surnames have been around so long that sometimes they get changed, and in some families, the second capital letter was gotten rid of. There was also a prefix for “daughter of” but these mostly fell out of favour. The daughter prefix was Nc, short for the Gaelic “nighean mhic.” Surnames for women like NcDonald were fairly popular in the 17th and 18th centuries, but after that time there were only a few secluded mentions of them. To a lesser extent, “Vc” was used to denote “grandson of,” so that a person would have two surnames, like John MacDonald Vcmaster for John being the son of Donald who in turn was the son of a master of some sort, but this tradition was never incredibly popular and is not as prevalent today. Ronald McDonald gets new outfit, takes on Twitter. Still creepy? How Many Burgers Has McDonald’s Actually Sold? Really enjoyed the article! When I was a kid my mom worked for the big local McDonald’s Franchise as a “promoter” to book and travel with Ronald McDonald. He would have appearances for 4-5 days a week at various McDonald’s locations, day cares, schools, etc. It was always kind of surreal hanging out with friends and Ronald McDonald walks into your living room. McDonalds was very strict on how the character was portrayed and how he carried himself. All of the appearances involved a small magic show and lessons on different values or safety. He never mentioned McDonald’s or the food during an appearance. Aside from the costume you’d never know that he was a corporate mascot. When he was driving he wore a different wig and top so that if there was an accident he wouldn’t be Ronald and he always had to be driven by someone else to an appearance as he was never to be seen except in full character. This brings back lots of good memories. Wow, that was in really really really poor taste. I know there’s a lot of problems with fast food, but frankly, references to actual murder should be kept out of such things. I never realized Ronald was missing till now! I did not notice! I’m not putting him down. I simply did not notice Ronald McDonald missing. I think it’s actually 1) Santa, 2) Mickey Mouse, 3) Super Mario, 4) Ronald McDonald, though Ronald seems to be falling off that list. He was forbade? Jeez. Do a grammar check, please, if there are no copyeditors there. I am sick of blaming childhood obesity on everything but the real fault…the parents! A clown does not make a child fat. A parent who has no self-control, can’t say no, and can’t properly feed their children is what makes kids fat. Let’s face facts, here. It’s the same reason why many adults are fat, they eat themselves into gluttonous stupors. No object, tv ad, or clown makes you fat! I, for one, miss Ronald McDonald. Bring back Ronald in all his red wigged, yellow jumpsuit glory and to tell with the blamers. Once again, it’s taking something joyful away from the kids who enjoyed him, just because of an obesity epidemic, people getting offended and the over-hyped creepy clown frenzy.